OUTDOOR DOG BEDS - FREE SHIPPING Orders Over $69. Outdoor can mean - sunproof, waterproof, durable - and then we include loads of style. Sunbrella outdoor dog beds that won't fade in the sun, great for porch, patio or poolside. 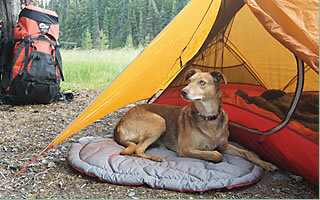 Crypton outdoor dog beds will give you the benefit of being sunproof and waterproof. Even, if you're just looking for a sturdy bed that can be left outdoors in your dog's kennel you'll find one here - Kuranda dog beds are famous for this. Plus loads of dog beds to keep your pet comfortable on a trip.